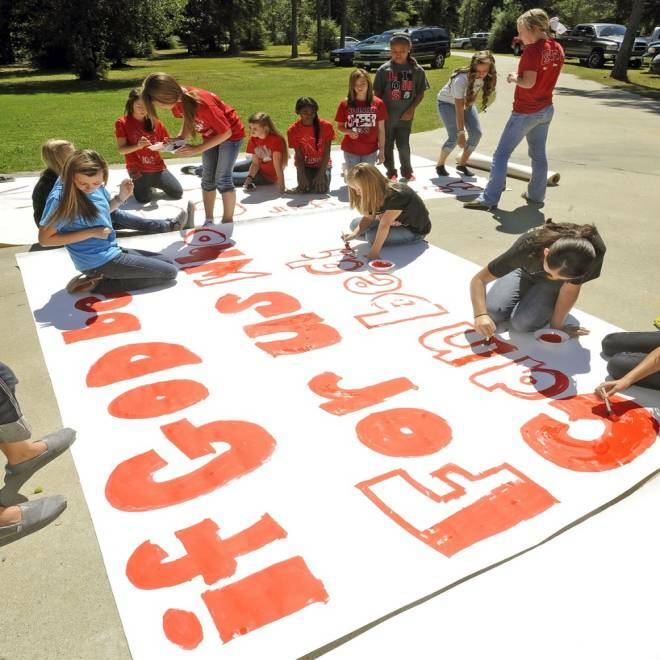 Kountze, Texas, High School cheerleaders and other children work on a large sign last fall. The high school's cheerleaders were told they could not use scripture verses on their signs at the football games, but a judge has ordered that ban lifted. A judge ruled Wednesday that cheerleaders at a Southeast Texas high school can display banners emblazoned with Bible verses at football games. State District Judge Steve Thomas determined the Kountze High School cheerleaders' banners are constitutionally permissible. In a copy of the ruling obtained by Beaumont station KFDM, Thomas determined that no law "prohibits cheerleaders from using religious-themed banners at school sporting events." The ruling ends the case in Thomas' court. A lawsuit over the banners had been scheduled for trial June 24. In October, Thomas granted an injunction requested by the cheerleaders allowing them to continue displaying religious-themed banners pending the lawsuit's outcome. Thomas at the time said the school district's ban on the practice appeared to violate the students' free speech rights. School district officials had barred the cheerleaders from displaying banners with religious messages such as, "If God is for us, who can be against us," after the Freedom From Religion Foundation complained. The advocacy group said the messages violated the First Amendment's so-called Establishment Clause, which bars the government - or a publicly funded school district, in this case - from establishing or endorsing a religion. Attorneys for the cheerleaders, who were supported by the Liberty Institute, a Plano, Texas-based nonprofit law firm, argued the girls' First Amendment rights to free speech were being violated by the school district and that the messages on the banners were not asking anyone to believe in Christianity or accept the faith. The cheerleaders in Kountze, located about 95 miles northeast of Houston, received support in their lawsuit from various state officials, including Gov. Rick Perry and Texas Attorney General Greg Abbott, who filed court papers seeking to intervene in the lawsuit on behalf of them. A Facebook group created after the ban, Support Kountze Kids Faith, has more than 45,000 members. The school district eventually reversed course and supported the banners, a move that prompted Thomas to issue his summary judgment so as to avoid a trial.